We accept all major credit/debit cards via PayPal. A PayPal account is not required to make a purchase. Click on “Don’t have a PayPal account” during checkout on the PayPal login page. We want you to be 100% satisfied with your purchase from the Dan and Louie Store! You are welcome to return any item in new/unopened condition before 60 days from purchase date for a full refund (not including shipping fees) to your account. Please contact us through our website contact form to obtain return shipping instructions. Include your name, email, and a copy of your PayPal receipt with your return request. Note: If you did not purchase the item from this web site, please return your item to the store of purchase. Items received that were not purchased from our site or are returned to us used or damaged will be shipped back to you postage due. Yes. Downloadable products can be purchased and downloaded from anywhere in the world. However, physical products can only be shipped to an address in the U.S. or Canada. When ordering outside the U.S., here are some things to remember: Factor in the exchange rate for the charges as well as for the cost of the merchandise. Your credit card company may also add a charge for currency conversion. The shipping charges and methods of shipment (usually either mail or courier) are not the total of the costs you’ll have to pay to get your package across the Canadian border. If goods are coming across the border, you will also have to consider, and be ready to pay, Canadian customs duties, taxes and custom brokerage fees as applicable. All orders ship from our warehouse in 1 – 3 business days. First Class International: Up to 30 Days. How do I cancel my All-Access Pass subscription? You can cancel your All-Access Pass subscription at any time. To do so, you can contact us through our contact form to request cancellation, you can cancel through our website, or you can cancel through your Paypal account. See PayPal’s instructions for cancelling a recurring payment. Can I make copies of Dan and Louie stories for my friends/family/church? Like most recorded works, Dan and Louie stories are protected by copyright law and cannot be copied to be sold, shared, or given away. You are, however, allowed to copy them to any devices you own and to make backup copies for your own personal use or for your immediate family members to use. What devices can I play my Dan and Louie digital files on? Dan and Louie digital stories are standard MP3 audio files so they can play on any smart phone or digital audio player including iPod, iPad, iPhone, Android phone or Blackberry. There are so many digital devices made that it would be impossible for us to list them here or provide detailed instructions for them all. Louie likes his iPod so we provide iTunes specific instructions on our site. Each device is different so if you can’t figure out how to get the stories onto your device, send us a message using our Contact form and we’ll help you find the answer! How do I copy downloaded stories onto my iPod/iPhone/iPad? Select folder containing the downloaded stories. On a Windows computer, this is typically Documents -> Downloads. Select the story(s) that you want to add to iTunes. The stories will copy to your device when you next sync with iTunes. If you have a non-Apple device, use the software and instructions specific to your device. How do I copy stories from my Dan and Louie MP3 CD to my iPod/iPhone/iPad? Insert your Dan and Louie MP3 CD into your computer’s CD-ROM drive. Select the drive containing the stories on the MP3 CD. On a Windows computer, this is typically the D: drive. Click the ‘Select Folder’ button. How can I turn my MP3 files into an audio CD? You can take your favorite MP3 stories and burn them to an audio CD that will play in any CD player. You will need a computer, CD-R (CD or DVD burner) drive, a blank CD-R disc, and iTunes software. Click the “+” button in the lower left hand corner to create a new playlist. Drag and drop songs from your Library file to the icon of your playlist. Click the playlist icon once to view its contents. You can reorder the tracks and make any last-minute changes. Insert a blank disk into your CD-R drive. Wait for the disk to finish burning. Do not close iTunes or open your CD-R drive until the burn finishes. Important note: You are legally permitted to copy Dan and Louie MP3 stories to CDs for your own personal use. You may not copy Dan and Louie stories to sell, give away, or broadcast. Click here for more information on making a Dan and Louie stories CD using iTunes. 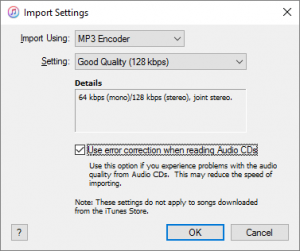 How can I turn my audio CDs into MP3 files? Set the settings to what you see below and click OK, then OK again on the remaining window. Once your CDs have been imported to MP3 files, you can copy the files to any device you may own. If you have an Apple device, you can sync the files right in iTunes. If you have another brand of device, click here for more information on where your MP3 files are stored in iTunes. Now that you know where your files are, you can a make backup of them, copy them to your devices according the manufacturer’s directions for that device and even create brand new audio CDs to replace your damaged ones. Remember, copyright laws only allow these files to be used on devices that you own. But if you own 10 devices, feel free to put the files on all 10! My audio CD’s have become scratched and can’t be read. Can I get an MP3 version of the stories at no charge? Unfortunately physical products don’t last forever and we don’t offer a free digital products in such cases. But there are simple and inexpensive ways to fixed scratched CDs so that they will play again. Clean your CD. There are many helpful articles on the web that provide ways to clean and eliminate minor scratches. For deeper cratches, take your CD to your local DVD rental store or used DVD retailer and ask them to resurface the disc for you. They typically charge $1-$3 per disc to do this and it only takes about 5 minutes. After cleaning, try ripping your CD to MP3 files using iTunes or other software. MP3 files will last forever if properly backed up and you can create new audio CDs from them. A computer’s CD/DVD-ROM drive is usually much better at reading through minor scratches than an audio CD player. I’m missing a CD/tape from my set I bought awhile back. Can I get a replacement? We sell every story that was on your CD or tape as a download. You can go to our downloads page and find the stories you are missing, purchase and download them, and burn them to a CD or copy them to a cassette tape. How many Dan and Louie stories are there? There are 134 stories in the current collection. Of course Dan and Louie made a few more stories and sing-alongs than these. You may even have some of them on tape or disc if you are a long-time listener. The 134 stories that we sell are the ones most folks consider to be the best ones based on content and audio quality. Will Dan and Louie make any new stories? It’s unlikely that the dynamic duo will release any new stories. Dan is a very busy senior pastor of a large church and Louie has grown up and has a career of his own. Well, we’re kidding about the Louie part…he hasn’t decided on a career yet. But we may find a long lost story or two, polish them up, and add them to the collection. If you have a favorite story that is not in our catalog, let us know!